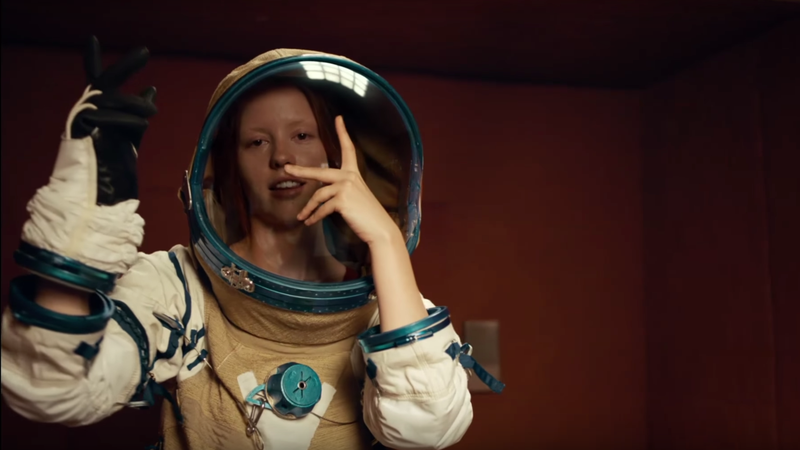 Mia Goth plays Boyse in High Life. High Life—French director Claire Denis’ first English-language film—follows the inmate crew of a harsh-edged box of an exploratory spaceship, sent on a mission to investigate a black hole under the belief their records will be expunged once it’s all over. Instead, the scientist assigned to the crew (Juliette Binoche) is actually there to conduct reproductive experiments on the prisoners, attempting to inseminate them against their will. After one such experiment leads to Robert Pattinson’s character fathering a daughter, High Life finds the duo attempting to find a way to stop the vessel from being dragged into interstellar oblivion. It’s a hauntingly cryptic look at Denis’ first foray into sci-fi, full of weird and sinister imagery as Binoche’s doctor stalks about the place. Early reviews from the film’s debut at TIFF last year painted a picture of a film that’s as visually stunning as it is obliquely confounding at times, but there’s enough going on here to have us intrigued to see more. High Life, which also stars André Benjamin (aka André 3000) and Suspiria’s Mia Goth, hits theaters April 12.